Part of the evidence we have for dark matter is through its gravitational effect on the motion of stars. The first evidence for dark matter came from motion of stars in our galaxy, which indicated there must be a large quantity of unseen mass in our galaxy. So why is it that when we look for the gravitational effect of dark matter on nearby stars, we don’t see anything? It turns out that tells us something very interesting about the nature dark matter. In 2012, a survey was done of about 400 red giant stars within a range of 13,000 light years from the Sun. The motions of these stars were studied to look for the influence of dark matter on their motion, and the results were published in the Astrophysical Journal. What the team found was that the motions of the stars could be accounted for by the stars, dust and gas in the region. There wasn’t any evidence of dark matter within the region. So does this mean there isn’t any dark matter in the region around our Sun? Not quite. The basic model of dark matter in the Milky Way is that it exists in a halo around our galaxy, with most of our galaxy’s mass being dark matter rather than regular matter (stars, gas, dust). Just how the dark matter is distributed within the halo depends upon the specific type of dark matter. 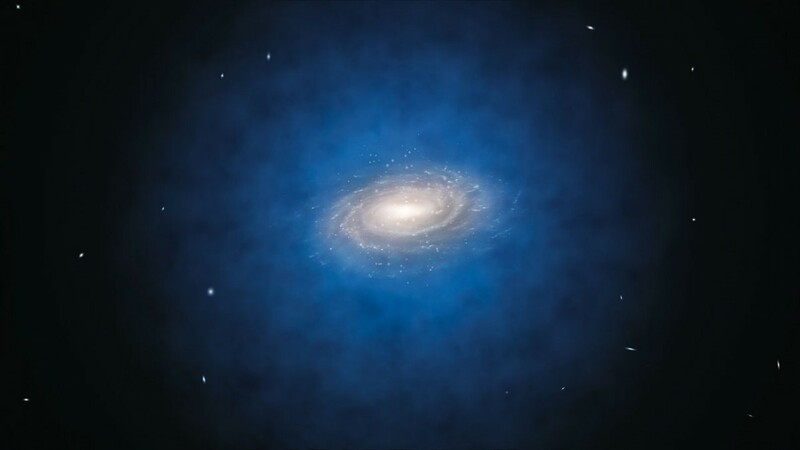 Observations of the universe on a large scale indicate that dark matter must be cold, meaning that the motion of dark matter particles must be relatively slow. We also know through sky surveys that dark matter is not something like primordial black holes. This means the leading candidate for dark matter are WIMPs, or Weakly Interacting Massive Particles. The simplest models for WIMPs suppose that they not only don’t interact strongly with light, they also don’t strongly interact with each other. If that’s the case, then the gravitational interactions between WIMPs would cause the galactic halo to have an ever greater density as you get toward the center of the galaxy. 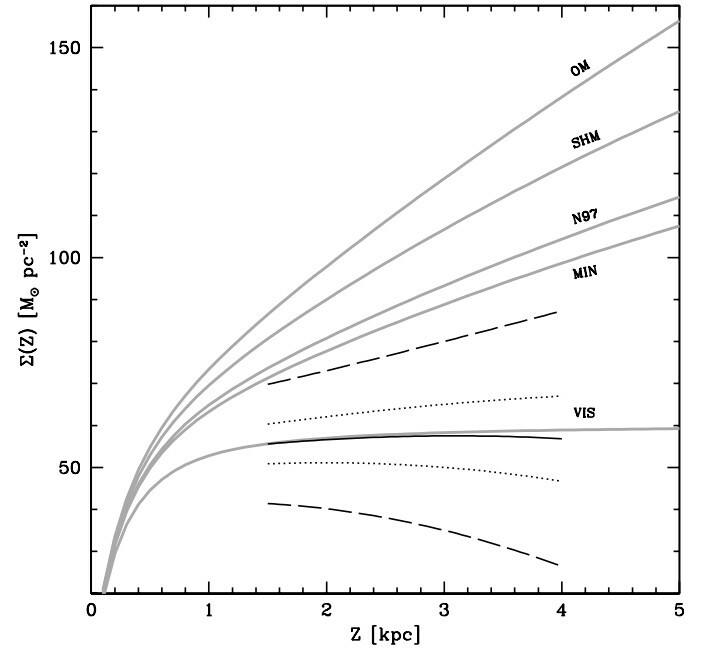 If this were the case, then the variation of dark matter density should affect local stellar motion. So it seems observational evidence doesn’t support these simple WIMP models. An alternative is that while dark matter particles don’t interact strongly with light and regular matter, they do interact with other. This would mean that the dark matter halo could thermally equalize through their interactions, and as a result the central region of the halo would be fairly uniform in density. If that is the case, then it wouldn’t have a large effect on local stellar motions. So it would seem that this study supports the idea that dark matter is self-interacting, or at least has some mechanism to thermally equalize. To be fair, the fact that we see no evidence of dark matter within the 13,000 light year back yard of our Sun could indicate that there is no dark matter in this region. It doesn’t seem likely given what we know of dark matter so far, but we can’t rule it out as a possibility. Either way, what we’re learning is that dark matter is even more complex and subtle than we had thought. Hope I didn’t offend you with my comments of the last few days. Not at all. I’ve been really busy with classes this week, and haven’t been answering comments as much.